The other Agent Cooper …. Two things I never thought I’d say. “I laughed at a Melissa McCarthy movie” and “Jason Statham is the best thing in it.” Yet, here I am saying both of them, and totally without irony. I may not be a fan of either, but I mean them both as compliments. The sweeping camera flying over an expanse of water towards a luxurious mansion and the overwhelming orchestral score, heavy on drama and strings, tells you exactly where you. Secret agent territory. More specifically, it’s Bond territory and it’s confirmed when you see Jude Law’s Bradley Fine, a spy dressed to the nines in his DJ and bow tie. But Bond he is a not. He has hayfever, sneezes and ends up shooting an enemy agent, who takes a vital piece of information with him! And that’s just the start. His eyes and the voice in his ear is McCarthy’s Susan Cooper, sat at her desk at HQ, constantly alerting him to imminent danger thanks to her array of technology and screens. But when he drops off the radar, she sets out to get revenge on the target that took him out and her original ambition to be a spy comes to the fore. She’s sent out into the field for the first time on an ‘observe and report’ mission. 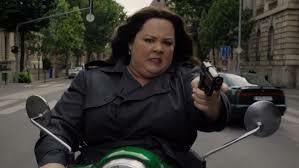 But she’s constantly hampered by Agent Ford (Statham) who’s gone rogue and is convinced she just isn’t up to the job. She’s no relation to Agent Cooper of Twin Peaks (who, by all accounts, is on his way back, courtesy of David Lynch.) There’s no fondness for coffee or cherry pie. At her desk job, she’s happy in a support role – her mother always told her she would come to nothing – hiding the fact that she did incredibly well during training. Now she has the chance she’s been waiting for and she jumps at it, although that doesn’t mean her mission goes without a hitch. There’d be no film if it did. Out in the field, her friend and colleague Nancy (Miranda Hart) is in her ear, although it’s not really a role that gives Hart much to do other than be her usual self. The fact that she and McCarthy look so different makes for a very short-lived sight gag. Most of the humour, both visual and verbal, works much better, most of it hitting the mark. Inevitably, some is pretty crass and there’s the predictable toilet humour and occasional very strong language. Don’t expect any subtlety because you won’t get it, but that doesn’t mean you won’t laugh. At two hours long, though, there are times when the film simply runs out of puff, albeit temporarily, before it gets another injection of laughter. And it comes from Statham who is hilarious as an outrageous parody of his usual on-screen persona, full of over-the-top monologues about the most implausible stunts he’s pulled off in his career. He’s gone rogue, so he pops up anywhere and everywhere, sometimes as himself, sometimes in dreadful disguises. You can’t help but have a certain admiration for somebody who not only takes the proverbial out of himself, but does it willingly, with huge relish – and pulls it off to a T.
Spy sends up the secret agent genre but never puts it down. And it makes for the perfect Friday night movie, complete with your mates and followed by curry and beers. You’ll have a very good night out! Spy goes on general release in the UK on Friday, 5 June. I like McCarthy. Sounds like she’ll get a franchise out of this one.